In the never ending pursuit for greater power output, engine builders add forced induction systems such as turbocharging, supercharging or nitrous injection; modify electronic induction system controls and install performance engine components. The combined result of such modification; extreme combustion, induction and exhaust pressures. To reliably seal such pressures requires an advanced gasket design. The Permaseal MLS-R range of head gaskets has been developed to meet such rigorous requirements. Engineered, designed and manufactured in Japan to exacting tolerances Permaseal MLS-R head gaskets offer the performance engine builder the highest levels of uncompromising quality. Permaseal MLS-R head gaskets incorporate state of the art multi layer design featuring a stopper layer for superior combustion sealing. Also, the extensive use of stainless steel materials allows each individual layer to be thinner delivering increased rigidity and durability, uniform heat distribution and improved thermal transfer. All this aids in a balanced, even distribution of clamping loads across the entire sealing surface minimising cylinder bore distortion. 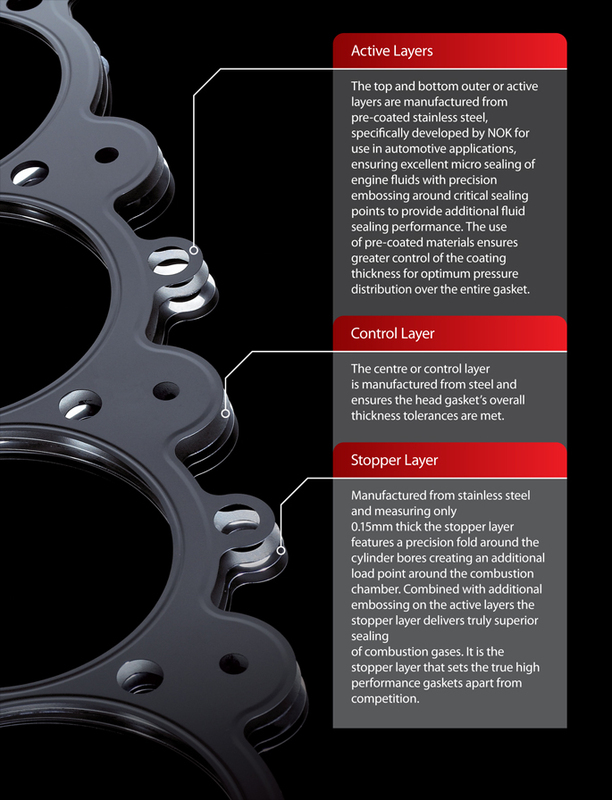 To learn more about the multi layer construction of the Permaseal MLS-R range of head gaskets follow this link. Complimenting the range of high performance cylinder head gaskets, Permaseal MLS-R also offers a range of multi layer turbo charger flange gaskets, turbo charger gasket kits, manifold gaskets and valve regrind gasket sets. Visit our site regularly to keep up to date with new and feature items.